These DJI E800 1345 Self Tightening Black Propellers with Yellow stripe are carbon fiber reinforced with a quick release system, they have been specially designed to be used with the DJI E800 Tuned Propulsion System, they have a built in nut with threads to allow self tightening while in flight, they require a special spanner to undo them after flight. Please note that these props will only work with the right and left handed threaded motors. Packet Contents: 2 x (13 x 5 inch) 1 x CCW propeller, 1 x CW propeller in Black are supplied in the packet. 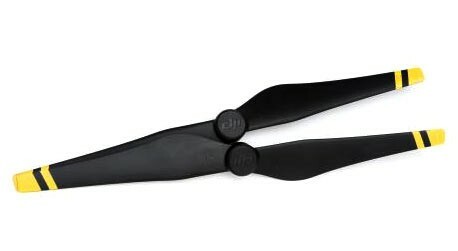 The DJI E800 1345 propellers are dynamically balanced at the factory which removes the jello effect seen on video taken from the camera when airboure, the low inertia and aerodynamic efficiency of the 1345 propellers means that you can use higher gain values to deliver a great level of maneuverability & stability from your flight controller.